photos by Christian Hunold / CCCEEC docent Jeremy GriffinThe docent starts our walk with the history of the Cobbs Creek Community Environmental Education Center (CCCEEC). Before I relate that history, picture the docent. Maybe a gray-haired white person with a nametag and a fanny pack? Someone who loved the park so much that they decided to volunteer there when they retired? Wrong. Jeremy Griffin is a 17-year-old African-American student from West Philly. 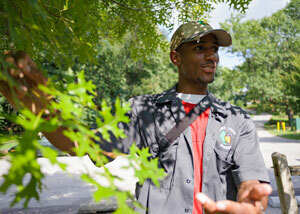 He loves ecology and comic books, and he leads tours of Cobbs Creek twice a week. He knows his trees and birds, not to mention the history of the center. That story started before he was born, in the early 1990s, when community activists led by Carole Williams-Green raised money to convert abandoned horse stables into classrooms, labs and meeting spaces. The center finally opened in 2001, about when Griffin was in kindergarten. Gathered in front of the Cobbs Creek Community Environmental Education Center are: (l to r) docents Jeremy Griffin, Micah Henry, Aaron Henry, environmental educator Tony Croasdale, and docents Zach Brown and Tykee James. While specimens in glass cases or animals in zoo enclosures can amaze and enlighten us, nothing beats the real thing in the wild. But the hard part is understanding what we’re seeing. We headed out to the creek itself, pausing on the bridge to watch deer downstream watching us. Griffin and his fellow docents had to point them out, since I was studying the water for the tadpoles of the bullfrogs that often serenade from the banks. They also pointed out the ducks resting in the shallows, heads tucked in. The docents are endearingly nerdy at times — at one point picking up a Marvel vs. D.C. argument — but quite serious about their role of introducing Philadelphia to one of its great parks. In a slight lapse of seriousness, Tykee James, 19 (now an intern, CCCEEC docent Tykee James having graduated high school and started at Temple), asks me how to tell that a particular tree was a dogwood. “It’s the bark,” he deadpans. We move on to view the created wetlands at Naylor’s Run, a Cobbs Creek tributary. “This is the sponge that absorbs water in rain events,” James explains. The docent program, created in 2011 by Williams-Green and Croasdale, is largely funded by the Philadelphia Water Department (PWD), and the kids are as much water quality ambassadors as natural history interpreters. The park has more recently seen a surge in support from the City as well as groups under the umbrella of the Darby Cobbs Watershed Partnership, facilitated by the Pennsylvania Environmental Council. A 5k race in the park is heading into its third year, and Cobbs Creek has gained prominence as one anchor of the new 58th Street Greenway.